"The Great Colorado Chicken Hunt" got off to a less than auspicious start when, following a couple of weeks of nice weather, a snowstorm chose the day of my arrival to visit Denver, cancelling flights, closing highways, and generally causing trouble. Luckily for me, my flight wasn't among the dozens cancelled, and was only delayed twice, for a total of an hour and a half. Upon arrival in Denver, I spent another hour trying to contact my hotel for pickup, eventually managing to drop my bags off in my room and find dinner much later than I had anticipated. So much for joining an owling walk! The next morning my good fortune continued when I went to pick up my rental. After 20 minutes of high pressure upsell attempts on everything from a 4X4 (warning I wouldn't make my destination in the Dodge Avenger I had selected) to extra insurance, I found my car easily enough, snowed into a parking spot. 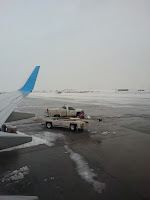 After 15 minutes I was able to free the car and was on my way, learning through On the Job Training the fine art of driving on ice, the days subsitute for the I-70 in Denver. Impressive for a Victoria driver, I managed to avoid being a casualty of one of the half dozen accidents I passed, and once out of Denver City Limits, the roads became, for the most part, pavement. My first planned stop driving west was Silverthorne, home to not only outlet malls (and I did sneak in an hour of very disappointing shopping), but good numbers of Rosy-Finches of all three varieties as well. My plans to track them down were cut short by threatening weather that had picked up, as well as planned construction delays along the highway. I decided that it would be best to keep moving through the mountains, and also skipped one of my backup Rosy-Finch spots at Snowmass. Finally, coming down from Vail, I encountered one last heavy snow around Eagle that slowed traffic, and then the white stuff was gone. Easy sailing to my destination, Grand Junction, with a few fairly unproductive birding stops along the way, adding birds only to my Colorado list. The pre-dawn crispness greeted me on my first day of real birding, and I headed further west, into Utah, stopping at a viewpoint for my first Utah bird, Mountain Bluebird. 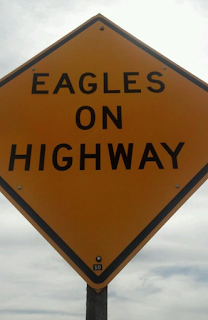 This was followed closely by a few more, as well as a sign warning to watch for eagles on the highway. Things picked up nicely when I turned off the I-70 onto Highway 128, a back route to Moab that a friend had suggested. Immediately after turning off, Horned Larks appeared in droves along with Common Ravens, and finally, two of the promised Golden Eagles not far off the road. The secenery also became spectacular at this point as Highway 128 wound through a river canyon, and I got my first looks at Utah's rock columns. A few more birds appeared on the way, including Say's Phoebes and Red-tailed Hawks, plus a few "lifer" mammals, White-tailed Prairie Dog, White-tailed Antelope Squirrel, and Rock Squirrel. Arches National Park near Moab lived up to it's reputation, and even though I had come as much for one of my long-standing nemesis birds as I had for the scenery, I spent much more time admiring the rock formations than I did searching for birds. I will leave further pictures of the park to your searching, needless to say I took lots! Arches was fairly quiet on the bird front, but did give up a pair of Cassin's Finches, a small flock of Black-throated Sparrows, easily my favourite sparrow, and more ravens. Finally, after pishing throughout every bit of juniper in the park, near the end of the road, my pishing stirred up a very upset Juniper Titmouse, my first target of the trip, and a nemesis bird. The remainder of the day was anti-climactic, with little else showing in Utah, or my return to Colorado. The following two days were spent exploring Mesa County from my base in Grand Junction. A trip up the scenic byway over Grand Mesa was disappointing in that every sideroad was closed by 4 to 6 feet of snow, and I didn't find my hoped for birds near the top, but the trip up did turn up several birds near the town of Mesa, including my first Western Scrub-Jay. The backside of the mesa also produced some interesting birds, including Colorado's first two Red-naped Sapsuckers of the season, also the first March record for this species in Delta County, where I found them. A flock of Sandhill Cranes near the town of Delta was a nice add, though I missed the numbers that had been seen in the Grand Valley. A walk around a nature trail in Grand Juntion turned up two early Lincoln's Sparrows and most of the expected waterfowl, and I joined the local Audubon bird walk on the Colorado River trail on the Wednesday. I always like to connect with local birders where I can, to get a little local knowledge and insight. One such bit of local knowledge was an explanation of all of the laundry baskets I had seen in trees. Apparently, after West Nile decimated the local magpie population and the nests had fallen apart or been destroyed by the young Great Horned Owls that were raised in them, a lack of suitable owl nests prompted the locals to put up laundry baskets as substitutes. The walk along the river also turned up my only Wood Ducks of the trip, a couple of Gambel's Quail, and a small flock of Cedar Waxwings, a nice surprise for all. I was welcomed at the walk with open arms, and had great chances to chat with the other folks. A quick spin through Connected Lakes State Park yielded little, aside from my my only Bushtits of the trip. Wednesday afternoon was my final birding in Mesa County, as Thursday was to be a tourist day. 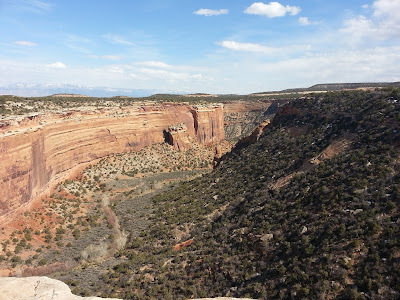 After a fantastic lunch at 626 on Rood in Grand Junction, I headed up to Colorado National Monument, supposedly a very birdy area. My first stop, the Devil's Kitchen trailhead, most certainly was. No sooner had I left the car then Canyon and Rock Wren were both heard, and the bird I had travelled to Utah for, Juniper Titmouse, was present in multiples. The remainder of the Monument turned up little of interest, besides more spectacular scenery. After touring the National Monument I spent an enjoyable hour and a half watching feeders and talking birds at the home of a local birder, hoping for titmice and Rosy-finches. Though neither showed (the Rosy-finches had last been seen a couple days prior), we enjoyed great looks at Lesser Goldfinch, Gambel's Quail, and Pinyon Jay. Finally, while in Grand Junction that evening, a group of 8 Turkey Vultures put in an appearance, one of the first sightings for the county, and my first of the trip.